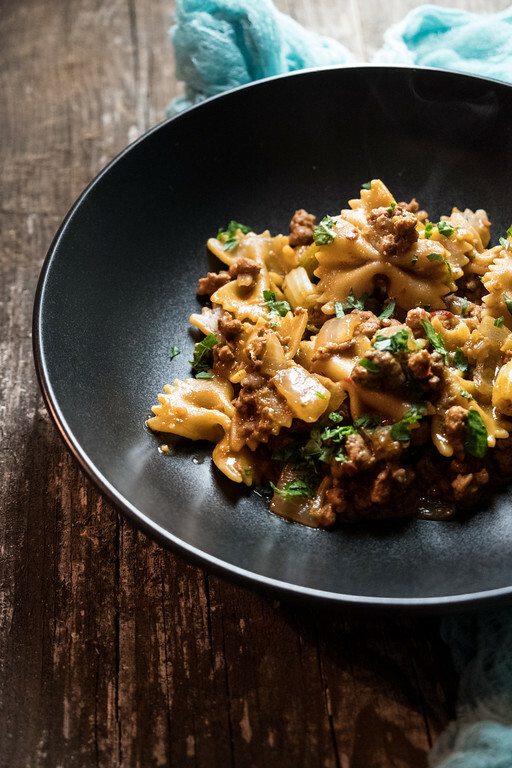 Use your Instant Pot to cook this delicious and easy Instant Pot Ground Pork and Pasta. The pasta cooks with the pork and picks us so much more flavor! Post may contain affiliate links. To say that I love my Instant Pot would be an understatement. I love, love, love my Instant Pot. Whenever I want an easy dinner, a dinner that I don’t have to stand over the stove watching it, or peeking into the oven to check doneness, I turn to the Instant Pot. Some weeks, I cook entirely from it. Last week was one of those weeks. So much to do and stress over, that I needed cooking to be easy. What I love about the Instant Pot is that it can do almost anything I ask of it. One dish pasta meals are now my go to. I found this recipe in one of my favorite Instant Pot cookbooks, The Great Big Pressure Cooker Book. I can’t say enough good things about that book, with 500 easy recipes, there is something for everyone! 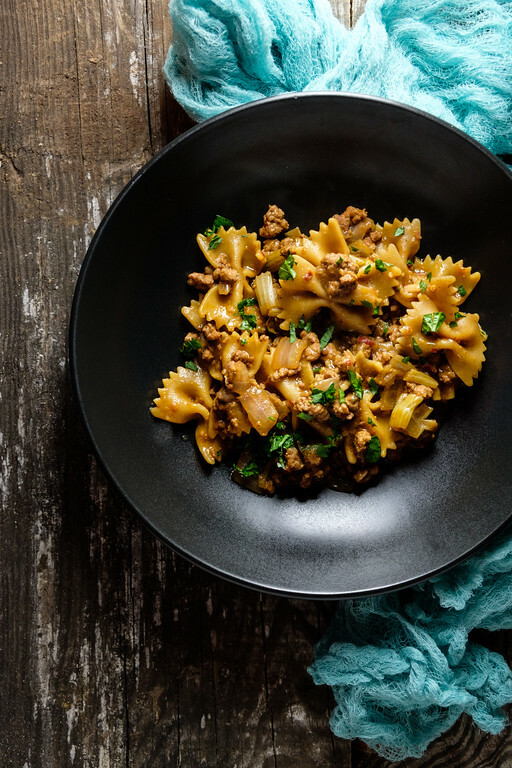 Click here to pin this Instant Pot Ground Pork and Pasta now! I don’t use a lot of peanut butter in my cooking, but this recipe has me rethinking that! The combination of peanut butter, soy sauce, sambal oelek, Worcestershire sauce, balsamic vinegar and brown sugar is amazing. It all blends together in a completely unique flavor. I also love that everything, including the pasta cooks together. Instead of trying to coat the pasta with sauce, the pasta picks up so much flavor as it cooks in the sauce! Looking for more Instant Pot Recipes: Instant Pot Red Wine Beef Stew and The Best Instant Pot Chicken Noodle Soup! 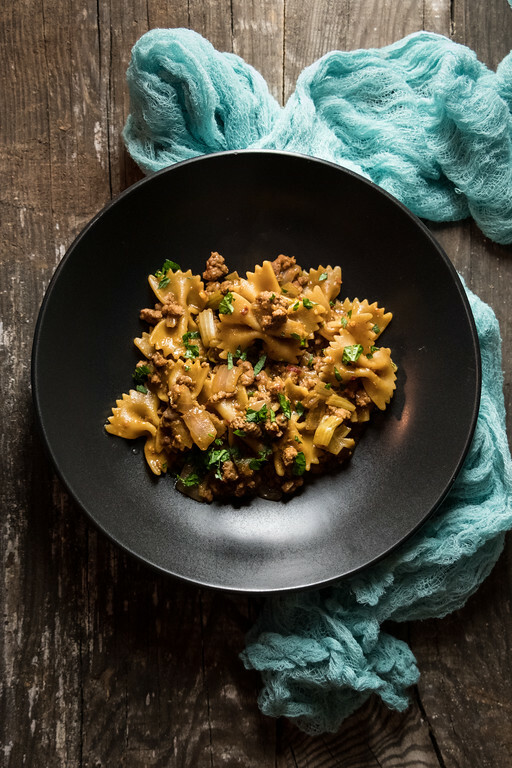 This Instant Pot Ground Pork and Pasta cooks all in one pot and gets lots of flavor from it's spicy, sweet, peanut sauce. In a medium bowl, whisk together the peanut butter, soy sauce, sambal oelek, Worcestershire sauce, vinegar, and brown sugar. Heat 1 tablespoon of oil in the Instant Pot set on the saute function. Add the pork and break it up as it browns, for about 3 minutes. Using a slotted spoon, remove the pork and add to the bowl with the sauce. Drain the fat from the cooker. Add 1 tablespoon of oil to pot, still set on Saute. Add the onion and celery and cook for about 4 minutes. Add the ginger and garlic, stirring for a bout a minute. Add the pork and sauce to the pot. Stir well. Add the past and stir until coated. Add the broth and stir again, until well mixed. Lock the lid into place and set the venting knob to sealing. Turn off saute and using manual, set the machine to cook at high pressure for 8 minutes. Use the quick release method to return the pot to normal pressure. Unlock the lid and stir gently before serving. This dish is amazing! The first time I followed the recipe exactly and it was delicious. Tonight I’m going to stir in some spinach leaves at the very end. Can’t wait to eat this again tonight!! So glad you like it!! I love the idea of adding spinach! Delish but I felt it had too much meat. The second time I doubled the recipe and kept it at 1lb meat and it was perfect. Oh, I’ll have to try it with less meat! Thanks for the suggestion. This recipe was great! So easy and tasty! I was a little worried about it tasting too much like peanut butter, but the end result almost tasted like a nice Hoisin sauce. This is a great recipe that we would really enjoy! Happy to see you here at Full Plate Thursday and thanks so much for sharing with us. I don’t have an instantpot (and I can barely read what I’m typing in the pale gray font so forgive typos) but I really like the flavors. I’m going to try to adapt it to a skillet… I’ll let you know if it works.